Dragon Ball Z miniatures game to coincide with 30th anniversary of the anime series in 2019. IDW Games, July 10th, 2018 announced today a new series of games with Toei Animation Inc. for Dragon Ball Z and Dragon BallSuper. 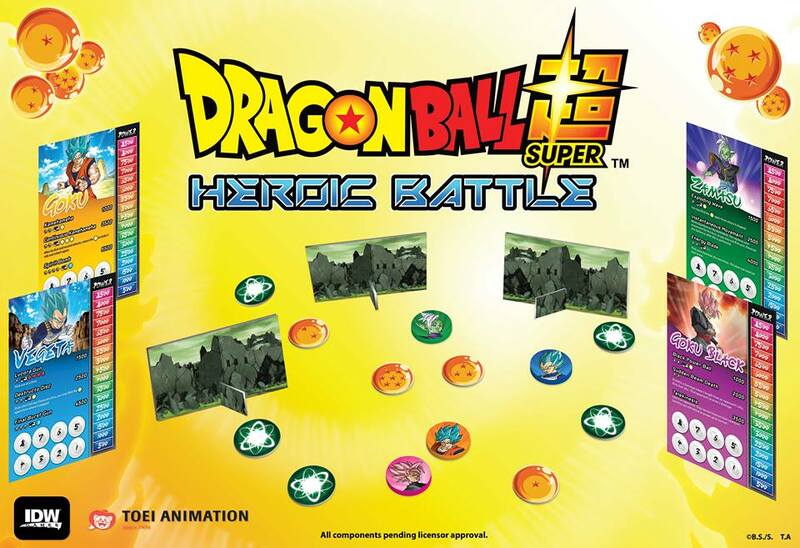 This announcement coincides with the expansion of their current Dragon Ball Z licensing agreement to develop miniatures-based board games, as well as adding the Dragon Ball Super brand to the tabletop gaming category. IDW will extensively support both Dragon Ball brands with games releases through 2021. Upcoming releases include Dragon Ball Z: Over 9000, a bluffing and deduction game designed by Jon Cohn and Dragon Ball Super: Heroic Battle, a dexterity game designed by Spencer Reeve. In Dragon Ball Z: Over 9000, players select an iconic hero or villain from Dragon Ball Z and compete against their friends to be the first to get their power level over 9000. 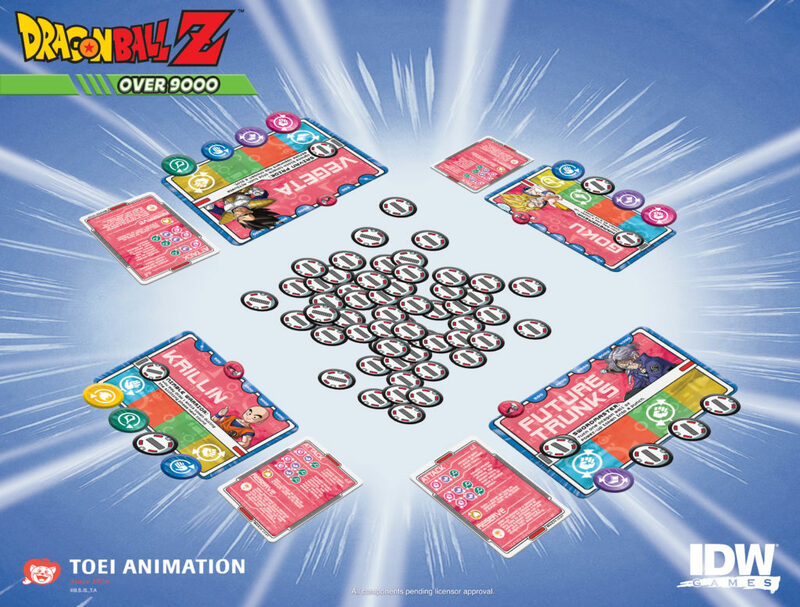 In Dragon Ball Super: Heroic Battle, players flick Goku, Vegeta, Goku Black, or Zamasu tokens into their opponents to deal damage and gain power. Players can power up and unleash special flick attacks that can send their enemies bouncing off of each other, or into ‘destructible’ 3D terrain. 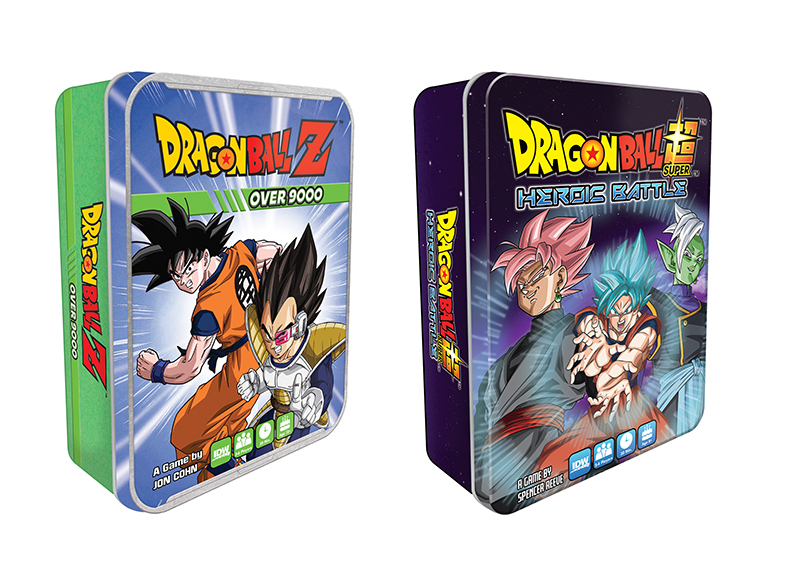 Both games will be packaged in collectible tins and available this holiday season at hobby and specialty gaming stores each with a $19.99 SRP. Also in development is a Dragon Ball Z miniatures game that will feature all new, uniquely sculpted miniatures. Players will take on the role of their favorite Z-Fighter as they battle iconic Dragon Ball Z characters, using familiar moves and items while creating epic moments in the Dragon Ball Z universe. The Dragon Ball Z miniatures game is planned to release in 2019 and will be supported with an extensive Kickstarter campaign. This agreement comes ahead of the Dragon Ball Z anime franchise celebrating its 30th anniversary in 2019. With three remastered classic Dragon Ball Z movies from the 90’s set for theatrical debuts in September and November 2018, fans of both Dragon Ball series can prepare for many ways to celebrate the legendary anime series on the tabletop. Want to know more about the upcoming Dragon Ball Z and Dragon Ball Super games from IDW Games? Sign-up on their website at www.idwgames.com to stay up to date on the latest tabletop gaming news. IDW Games’ diverse line-up includes the critically acclaimed Teenage Mutant Ninja Turtles: Shadows of the Past miniatures game as well as some of the iconic entertainment brands, including The Legend of Korra, Dragon Ball Z, Death Note, Sonic The Hedgehog, Atari brands, and Batman The Animated Series. Based in Los Angeles, Toei Animation Inc. manages the film distribution of Toei’s top properties, including Dragon Ball all series, Sailor Moon, One Piece, Digimon series, Saint Seiya, and many others to North America, Latin America, South Africa, Australia and New Zealand. Toei Animation’s Los Angeles office further handles all categories of consumer product licensing based on its film and television brands within these territories. SSA Public Relations for Toei Animation Inc.